Click on Pic to read many letters sent in. My name is Andra Evans and our company is K-9 University, Inc. Our training center is the foremost leader in obedience and behavioral problem solving in the North Dallas area. (We were voted #1 in North Texas by Channel 5 KDFW last year). We have 2 locations and we've been here 17 years this June. Most of our business is veterinary referral. Two years ago, we trained 2 dobermans for Jeff and Valerie Sledge and were impressed with the stability of the dogs. We inquired about their breeder and that's how we found out about you! The purpose for my inquiry is we are seeking a Doberman for our own personal pet. Needless to say, the puppy would have extensive training because we also use our own personal pets to do obedience demonstrations. (Our customer base is presently 7000+). I have very limited experience in working with breeders, so I have a few questions for you. Should we be concerned about choosing the last male in the litter? Do you find the size and temperament consistent throughout the entire litter? Would you considering offering a discount on the puppy as we would be able to personally testify as to the quality of your breeding program? Also, where are you located and can we take the next step in seeing Tux? NOTE: Andra was inquiring about Ellie's 3rd litter bred by the Watsons. There was only one male at the time. The match up did not take place. Nonetheless, sharing this letter since she's a reputable trainer and had unbiased interaction with two of our Dobermans. Just thought I would write you a little note to let you know Dakota is doing very well. It is hard to believe he is 8 years old already. Cheyenne will be 9 in January. 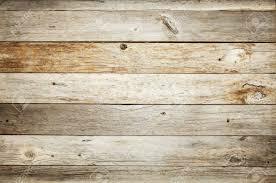 I recently found your web page again and enjoyed looking at Dakota's siblings. 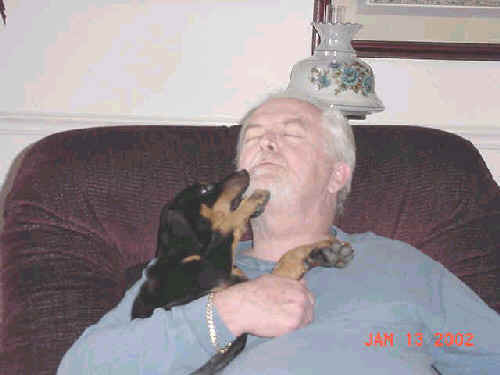 Dakota is very devoted and has been my shadow since he came home to us in '01. He definitely has a unique personality. Happy holidays to you and your family." "My name is Nick and I am interested in your puppies. By the way, you have a great web site. I have been checking it out the last 3 days! Anyway, I live in Waltham, Mass (next to Boston). I have been researching what kind of dog I want for the last couple of years in anticipation of finally getting one of my own. 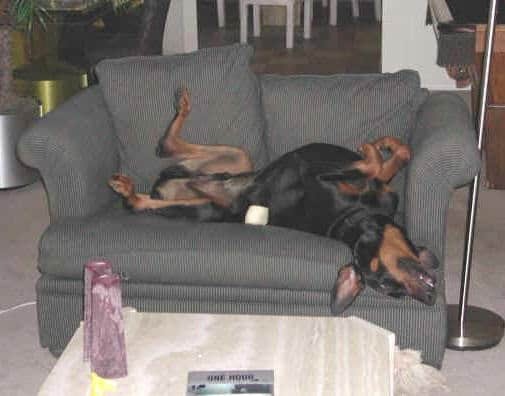 I have decided that a Doberman is absolutely the best dog for me!" My name is Marjorie. My new husband, Jay, and I purchased a pup for Laura last April. 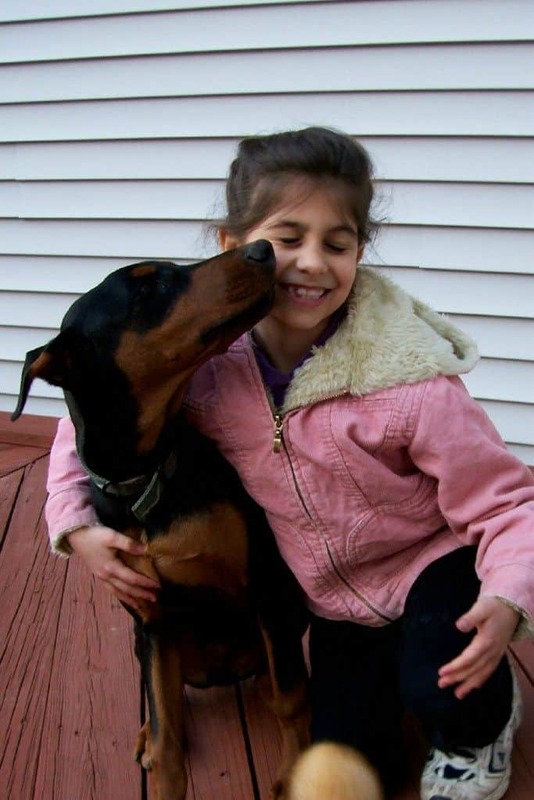 I was a little concerned because I’ve never owned a Doberman before, but when I visited Laura’s home and was greeted with “dog kisses” instead of loud harsh barking, I knew this was the right decision. Laura’s 2 are so tame and loving – I was shocked! Her children run and play and climb all over them, and they remain calm and relaxed. 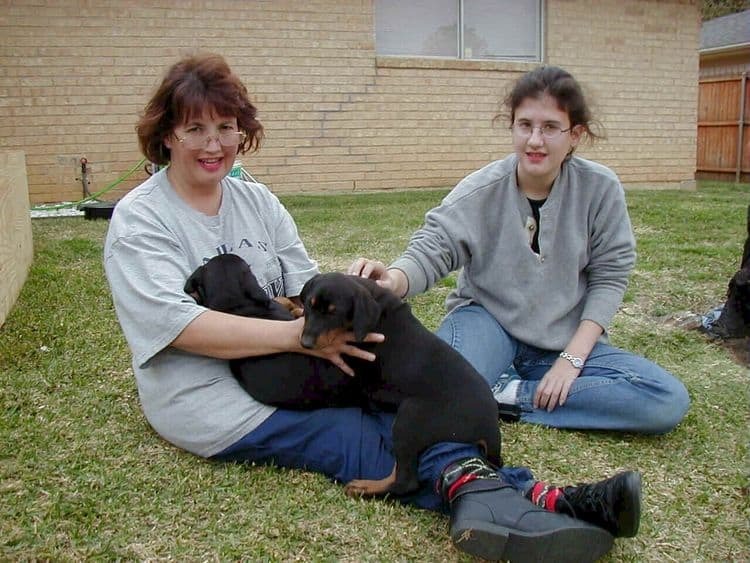 The real test was when the mom allowed us to play with the pups when they were only a few weeks old. Our kids are on Laura’s website playing with the puppies. She just walked around us, not concerned at all that we may have been hurting her pups. Our pup, Cleo, will be a year old on April 1st, and she is wonderful. Great temperament, smart, and silly. She’s very alert, and will bark if she needs us to pay attention to something, but never threatening. She’s a beautiful, healthy dog, and Laura takes great care with the pups. If (or when) we decide it’s time for one more, we will definitely go back to Laura. 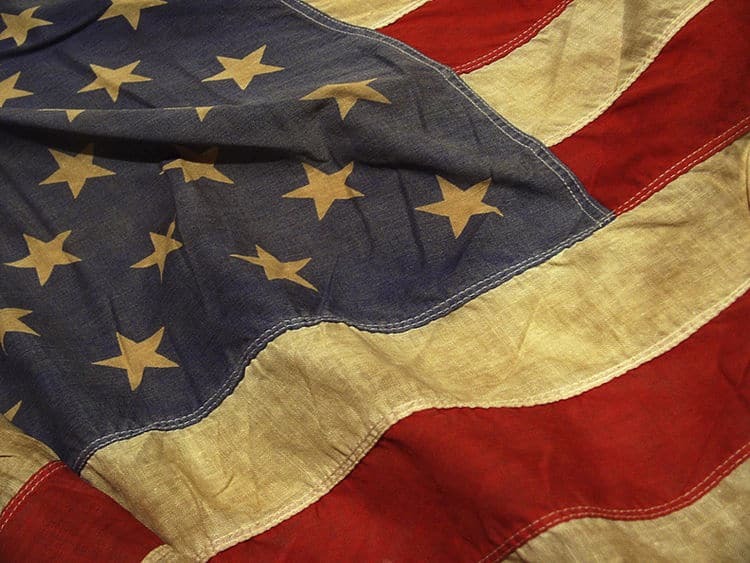 If you need additional information, please don’t hesitate to write or call. I got Betty almost a year ago from the Garretts. She is wonderful! Betty and my 9 year old daughter are best friends. Betty also likes to play with all the other little neighborhood kids. She has a great temperament. She even plays pretty good with our cat, although she can get kinda rough sometimes. I don't think she knows how strong she is. 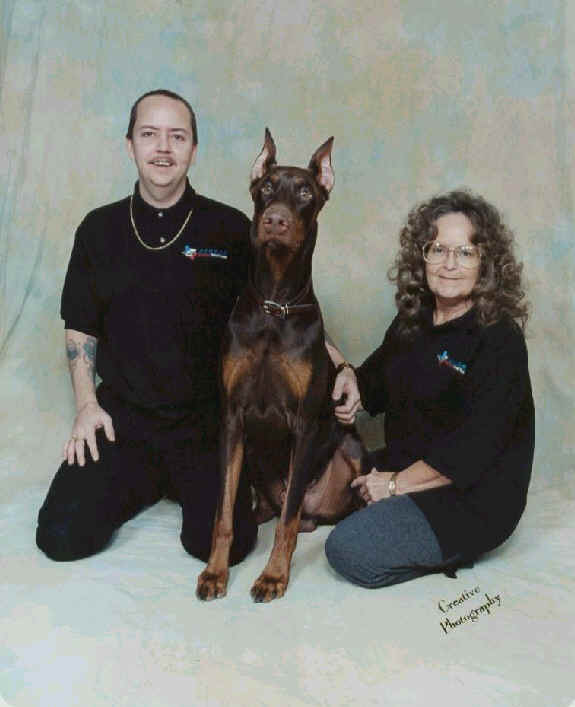 If you want a Doberman, I recommend the Garretts. You won't regret going with one of Scarlett's pups! "My husband and I have a Scarlet, too -- Lady Scarlet. She is 1 year old and we love her to death. I keep thinking I might do a black as soon as we get her where I don't think she will hurt the puppy, not knowing much about Dobermans doesn't help - LOL. She is a wonderful animal, but a little high strung at times. Well, just wanted to let you know your web site is "out of site". Great job posting all that you do and you definetly have gone into my favorite places. I appreciate it!! Really do! That puppy stage can be trying since they are such BIG pups - ha! Look at these Girls! Faith and Violet in March. I wanted to again express how grateful we are to you for raising such a true to standard breed of dog. Sounds silly, but you actually have changed my life. I never thought I would own a dog like this . Well, please put us on a waiting list for your next litter. We would never consider going anywhere else. Our family does not overlook all the little extras you do with your pups to make them so special. 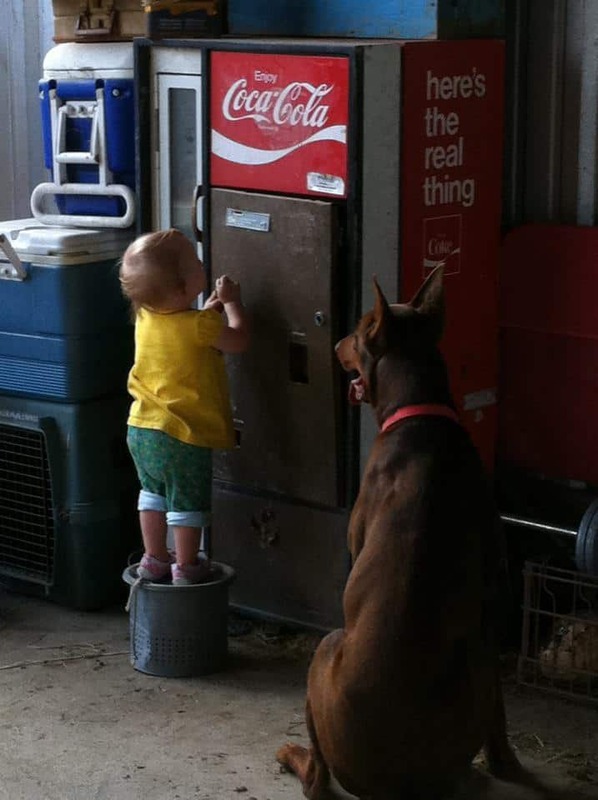 "Here Laura, I really want you to see this picture....it shows how good Dobes are with children! 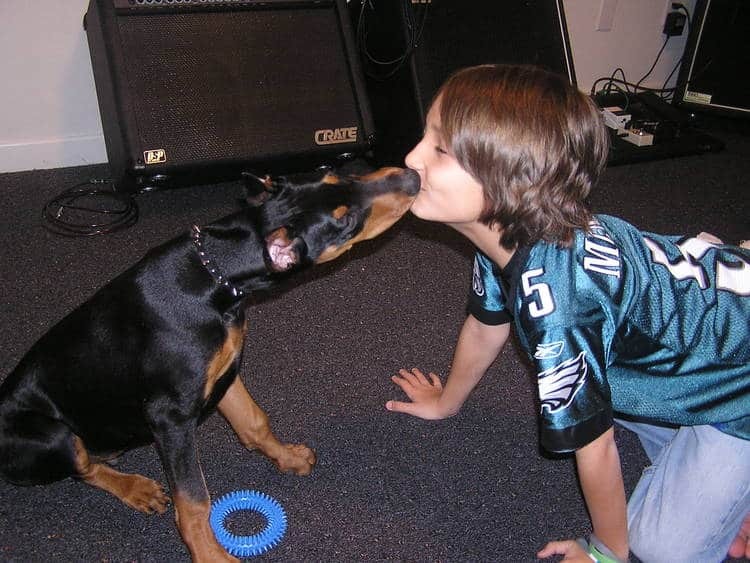 He is SO good with Zakk - they love to play chase and wrestle!" Note: Good information provided on this page regarding training and stages of puppy development. Tell the Garretts that those are some really, really pretty puppies. You guys should be proud. A lot of them took after Mr. Man (Harley), but their female is absolutely gorgeous. They are the prettiest puppies I think I have ever seen. "I am like Rhonda (above mentioned breeder), you have the best looking pups I have ever seen. I hope my pups get that pretty. The web site looks great! Pat"
Hope that ya'll are doing well. "Hi! We are please to give any information/reference on Laura Garrett. 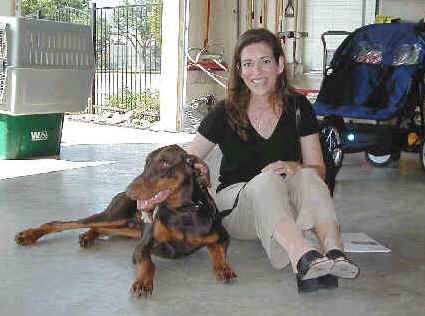 We purchased our female Doberman, Natasha, from Laura in March, 2000. We think the greatest of them: as breeders and as a family. You can learn a lot about a breeder, I believe, by observing how their family life is, how their dogs and puppies were treated and interacted with the family." "We were there over 2 1/2 hours in their backyard studying 2 female puppies - trying to make the decision between them (2 females were available at the time). My college daughter was with me as this was to be her dog and this gave us time to visit and watch the other puppies with their Mom, Aggie. We have kept in touch with Laura with visitations with Natasha to visit her Mom, Aggie, and on one occasion, Natasha spent several days with them while we were out of town. We couldn't leave her at a boarding place - at that time hadn't found one we trusted." 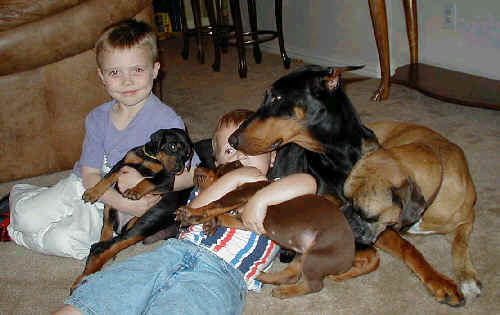 "Laura breeds for the future of Dobermans. She is not a person who breeds 'for money', but to promote the breed. She promotes safe, family pups and does not breed for aggressive dogs. She provides for the pups and Mom the best of medical care, all shots, etc. Our Natasha is a house dog and has been the best dog we have ever had: smart, loving and the most gentle, big girl you would want. Her Dad, Sebastian, was over 100 lbs., and Natasha is also." I was and remain very happy with the pup I got from Laura last year. After doing some local research in the Arkansas area, I decided to drive all the way to Dallas to get my "Kala". She weighed 13# when I picked her up and she has peaked at around 75# (ideal size for a female). She has been healthy from the day we got her. We had her ears done and she is a beautiful Dobe. Kala and I went through a basic obedience class when she was 6-mo old and she did very well. She is an extremely smart dog with all the typical Dobe characteristics, the best of which is her desire to always be by your side (hence the nickname "velcro"). Dealing with Laura was a pleasure, right from the start. We talked about whether I should get a male or female puppy, since we already had a 5-year old Bichon in the household. I then picked my pup from pictures she had, and Laura held the pup for me until I could get to Dallas. I guess the thing that impressed me most about Laura as a breeder (other than the quality of her dogs) was her website. I could immediately tell that she was a person who loved dogs and wanted you to learn all you could about your new pup. And maintaining a web page for each owner showed me that she really cared for her dogs, even after she sold them. I thoroughly enjoyed reading about and seeing all the other pups from the 2nd litter (I also read about the 1st litter). Bottom line - I would recommend Laura as a breeder without reservation. Even my local vet said that Kala was a fine specimen of a Doberman. "Our first 24 hours together have been great. Even last night wasn't too bad. We put her in her cage at the foot of our bed. She woke up a few times and started whining, so I just laid down on the floor beside her and reached my hand in the cage to touch her. She sniffed and went right back to sleep. Tonight her cage will be set up on a box and placed right beside our bed, where I can reach out and touch her without getting out of my bed. "Kala and I have really bonded, and she follows me everywhere I go (inside and outside) - just like she did you. I took her with me to do some errands today, where she once again rode in her be in the back seat. Our other dog (Buddy the Bichon) is still jealous, but he will get over it. Only a couple of small accidents in the house. I take Kala outside regularly, and she does her job about the time her feet hit the grass. She is going to be easily trainable. 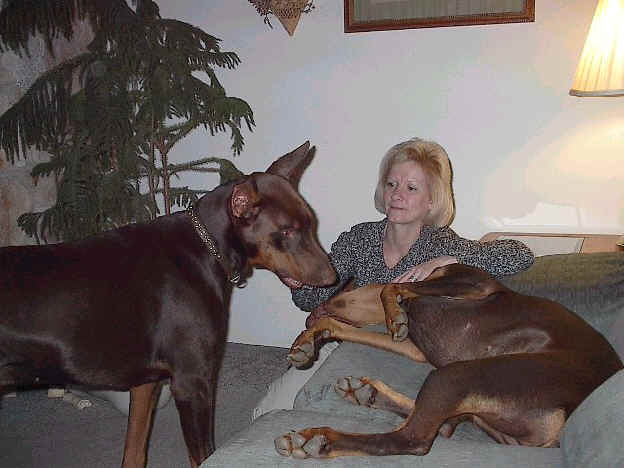 "My brother stopped by to see her today, and he brought one of his four Dobies - an 8 month old red male. The dogs sniffed and walked around together - Kala was not at all intimidated. "Here are three pictures taken this morning. The first is Kala napping on the couch. She went to sleep laying beside me; then when I got up, I covered her with a towel and she slept for another 30 minutes (right now she is under my computer desk sound asleep). The next picture is me holding her while she nibbles on my bracelet. Not the best picture of me, but I came off a really-long drive yesterday and was still pretty tired. The third picture is her giving me kisses (which we both like to do). "Thanks again for raising such a nice pup." "Did you get the new picture mom sent you? We went to Creative Photo in Sherman to have his picture taken. Harley is doing fine. I take him to the new dog park in Plano to play and he socializes and plays with all the other dogs. We also take him to Tailwaggers (a dog day care) to play with their dogs. They love him and want one of his pictures to put on their display to show him off. People are always coming over and asking if he is a special breed because of his size and talk about how beautiful he is. I tell them he is a superior Doberman and that his mother is from Kimbertal Kennel. I always give them your e-mail if they ask where they can get one like Harley. Harley minds perfectly and obeys on cue. We will have more pictures taken for Christmas and will send you some. Harley loves to play outside and watch the kids play baseball. He thinks their baseball is a play-toy. If a ball comes over the fence it's Harley ball then he will run and play with it until the leather comes off the ball he is so cute when his playing. Thank you for such a beautiful boy. Harley Road King. We plan on using Harley for Stud Service if you know of anyone with a female Doberman needing a male stud let us know. "Harley is starting to lose some of the puppy attitude, but still is just adorable the way he is always sticking his nose into everyone else's business. As an example, he leaves my bed pillows alone all day while I am at work - mainly because he is sleeping on the bed. As soon as I get home, he starts one pillow at a time to bring the bed pillows to the couch for me. When he has gathered up all three pillows, he will then lay on the couch and take a nap while I watch the news. We really do love him very much. I have nothing but praise and love for the puppy you let us buy. Thank you very much." I just had to update you on our progress. We renamed Arcas (by original owner) Marcas, to which he responded immediately. He is such a loving fellow. He has the gentle spirit that I had so prayed for in a companion. Not to mention that he is very intelligent, quite articulate, well potty trained and kennel trained fabulously. He has graduated from sleeping outside his kennel to his own bed. He and Shoes understand the ground rules and they get along very well. Marcas tries his mightiest to get Shoes to play and he is successful occasionally. Shoes, on the other hand, seems to instigate some trouble making. It all evens out in the end. Marcas is at the vet for an "operation". He went for a wellness checkup last week and all was well. Then this past weekend, we all went to visit "the cousins". Marcas quickly learned the rules at the first stop in Boerne. There his cousins were a 3 year old Great Pyrenees and a 2 year old Lab. The male Pyr was quite jealous so no play time was to be had. We then stopped at my sister's. She lives on about 7 acres and has a 6 month old Lab. That cousin was GREAT! They played for days and explored everything but always came back to check in with us. He truly is a great dog. Thank you so much. He is the answer to a prayer. For the first time last week, I woke up with a mission to start the day with a walk. The first walk since my surgeries. Marcas is a big ray of sunshine and he loves us dearly. Well, sorry for getting carried away. Joe and I were hoping for harmony and it was given to us. Marcas is a gem. We chose not to crop his ears, unlike his 70 lbs older sister who just turned 3. We could not have wished for better dogs. The two of them get along great, especially for kids. We recently moved (6 months) and they now have a backyard that is just over 0.5 acres. They live in the house when we are here and sleep in our bedroom with us. While outside, besides the great yard they enjoy a 65 sq. ft. dog house that sports a padded floor. Well, it sounds like I am writing a personals ad for our dogs, but just wanted to let you know that he is doing great. If you are ever in San Antonio, please do not hesitate to come visit. Thanks again for remembering and stay in touch. 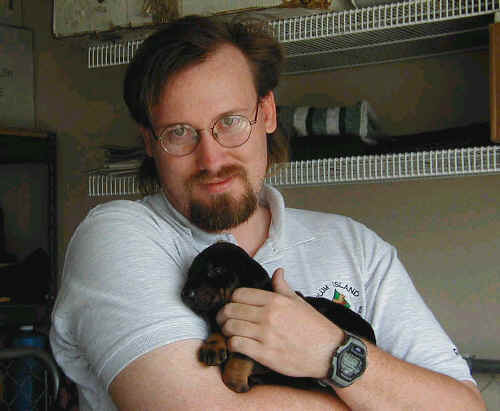 The Garretts first litter was in 2000. This picture is an all time favorite as it demonstrate's Aggie's awesome temperament.